Your dog can easily save the lives of countless other dogs. 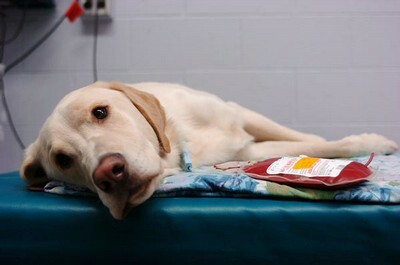 Every day hundreds of animals need blood transfusions, but there are few animal blood banks with a shortage of blood donors. Similar to human blood types, there are five major canine blood types, and one is a universal donor, like our “O negative.” When veterinarians purchase blood from a bank, they get the universal blood type, which can be used once on almost any animal without much chance of side effects or adverse reactions. However, if an animal needs multiple transfusions, the chance of a reaction goes up considerably with each one. Can your dog be a donor? Blood banks will require that a donor dog be healthy and friendly, weigh more than 25 kilos, be between one and seven years old, be current on vaccinations and free of parasites. The animal must be free of any medications except for heartworm and/or flea prevention drugs. Her heart must be sound, and the dog should have not received a transfusion in the past. The actual process of donating blood is quite simple. It takes about 30 minutes and does not require anesthesia. Blood is taken from the jugular vein – the large vein that runs along the neck. Giving blood will not hinder your pet’s normal activities, but you may want to let her rest easy that day and give her some extra tender, loving care. In addition to the obvious benefit of helping to save another animal’s life, there is sometimes a monetary reward for donating your pet’s blood. Some veterinarians offer the donor family a discount on future veterinary services.